The new Intel® IoT Developer Kit v1.0 software components are available now for immediate download on the Software Downloads page . 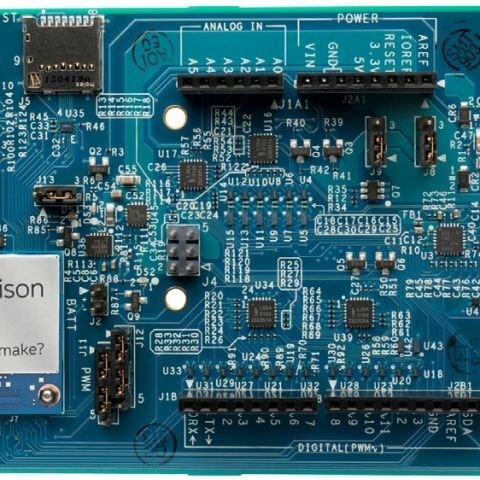 supporting Intel® Galileo and Intel® Edison. Intel IoT Developer Kit is targeted at hobbyists, students and entrepreneurial developers interested to build IoT solutions. Last year we hosted 10 roadshows world wide with over 1100 developers participating and over 200 projects were created with over 50 shared on instructables. In 2015, we are planning to host 20 IoT roadshow events for developer communities in cities across the US, Europe, South American and Asia. Please join us, get an Intel development board, popular sensors, developer tools and begin building something awesome. I am super glad that we decided to expose our developers to the beta version (in Sept '14) as opposed to waiting to finish up the rough edges. We were able to gather tons of feedback (good, bad and ugly) on the beta product - the valuable input we directly used to improve the product and bring you the release v1.0. Listening to you and focusing on what you cared the most helped us "prioritize" the features that we are building. Sincere thanks to all the IoT roadshow participants and to IoT developer community members for providing valuable feedback on the beta product. We did get a lot of positive product feedback that told us that we are headed in the right direction, but we also got some very pointed feedback on what should be improved. Please keep your feedback coming. "It is a pain to setup a new project. I though it might be a good idea to light a fire under them by showing how easily others have set up Eclipse. Eclipse is awesome, but the way they have it set up is horrible" -mikemoy gave his feedback And, I also heard a lot of Eclipse C/C++ feedback around "difficulty with setting up new projects" and "lack of meaningful templates and samples". So, fixing the Eclipse user experience by providing an easy option to create a new project from the menu as opposed to copying and starting from one of the given templates became one of our "Top Priority" requirement that we developed. We built a new eclipse plug-in for new project creation, improved the C++ templates and improved the UX to provide links to access examples and documentation. "please support real sensors not just beginner buttons and LEDS"
"sensor documentation and samples please"
"we can't build real interesting IoT projects with the sensors libraries you have"
So, we decided to focus our efforts in increasing the number of sensors and actuators we support via UPM libraries. We also worked on revamping the sensors we give at the roadshows - I will talk more about that in my next blog. We also worked very hard to improve the documentation and samples - but, it is an ongoing effort and we will continue to improve them. I am first to acknowledge that setting up an Edison board especially on windows in not easy or for the faint hearted. Lot of steps involved and community was screaming for a better and easier way to setup Edison. So, we decided to build a guided windows installer for Intel Edison. And, do note that the installer for Intel Galileo and installers for mac and linux users is on our roadmap and will be coming soon. Stay tuned - we heard you and we are working as hard as we can to improve the out of box setup experience. I know you must be thinking why we did not support this to begin with - I agree. For multitude of reasons we could not get to this for the beta release, so we did it now. I know you also maybe thinking - what about all the other 3rd party breakout boards - we are working on it as well and is on our road map. IDE, Eclipse* IDE, and Intel® XDK IoT Edition. As the Product Manager for Intel IoT dev kit, I am always looking for product feedback, ideas for product improvement and opportunity to connect with developers/makers using the dev kit. And, as you can see we pay very close attention to your feedback. Please keep it coming. Which is best amd or Intel?